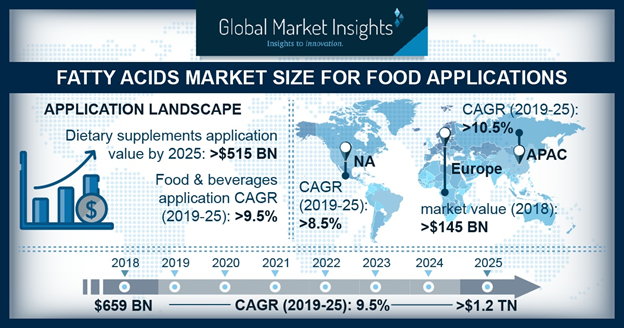 Fatty Acids Market for Food Applications is set to surpass USD 1.2 trillion by 2025; according to a new research report by Global Market Insights, Inc. Rising concern for healthy eating and growing consumer awareness of health benefits associated with essential fatty acids will drive the fatty acids for food applications market demand. These are not synthesized in the human body and obtained from plants, fruits and vegetable oils. Changing food habits and increasing importance of a balance nutrient-rich diet may stimulate the fatty acids market for food applications growth. Fatty acids are extensively used as dietary supplements for enhancing the growth and fulfilling the deficiency of nutrients and vitamins in a diet. They are available in the form of soft & hard gels, chewing capsules, powders and have the capability to prevent several health diseases. Growing sports & fitness industry and rising cardiovascular disorders in adults are key drivers of fatty acids for food applications market growth. Omega 3 based fatty acids market demand may witness significant growth at over 9% by 2025. Increasing demand of functional food along with rise in chronic diseases will stimulate the product demand. It is an essential fatty acid which helps in maintaining neurological health and reduces inflammation. Rising global dietary supplements market and increasing aging population have increased the demand of omega 3 in their diet which may boost the fatty acids market for food applications growth. Omega 6 based fatty acids market play a vital role in improving the metabolism of the body and are a primary source of energy for heart muscles. These polyunsaturated fatty acids contain antioxidants which are utilized in several skincare and personal care products. Rising demand for organic, chemical free ingredients in cosmetics and growing health concerns regarding synthetic antibiotics will boost the fatty acids for food applications market growth. U.S. fatty acids market for food applications market may witness significant growth at over 9.5% during the forecasted period. Increasing consumer inclination for a healthy lifestyle and growing demand of dietary supplements will drive the industry growth. Germany fatty acids market for food applications will surpass USD 23 billion by 2025. Growing awareness among people about the health benefits related to fatty acids has made manufacturers to formulate new innovative products in food & beverage industry. Omega enriched food & beverages provide essential nutrients required by the body, extend shelf life and prevent diseases. Rise in disposable income has increased the purchasing power of consumers which will stimulate the fatty acids for food applications market demand. China fatty acids market for food applications may register significant gains over 10.5% by 2025. Demand of unhealthy food & snacks, changing lifestyles and growing chronic diseases has increased the demand of pharmaceuticals in the region. China surpassed over 10 percent of the global pharmaceutical revenue in 2017. Omega 3 & 6 fatty acids work effectively for bone & joint health, prevent illness and reduce cholesterol levels in the body. Rising death rates has led to focus on preventive health measures which is likely to stimulate the industry growth. BASF SE, ADM, DSM, Oleon N.V. and Omega Protein Corporation are major industrial participants in fatty acids market for food applications. Manufacturers are focusing to develop their business by collaboration and forming joint ventures accompanied with focus towards R&D to improve product portfolio.